Mechanical reliability in Formula One is always a struggle for teams each year. FIA, the governing body of the sport, reworks and changes the rules for the teams to follow each year. 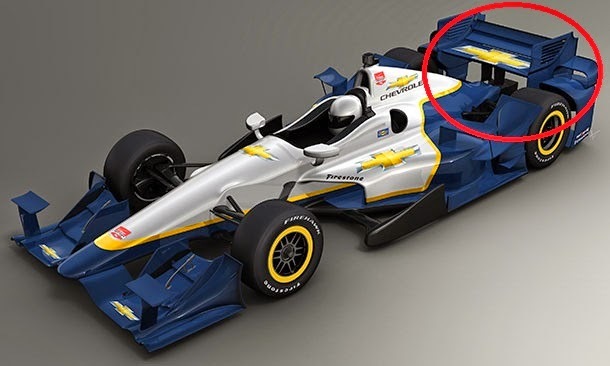 Just going from the 2013 to 2014 season alone, there were huge changes to the rule books concerning the cars. The switch from V8 to V6 engines, decrease in fuel allotment down to 100kg, and fixed ratio gearboxes were just a few of the aspects of the sport that the FIA decided to change. Whether these changes are good or bad, that depends on who you’re asking. 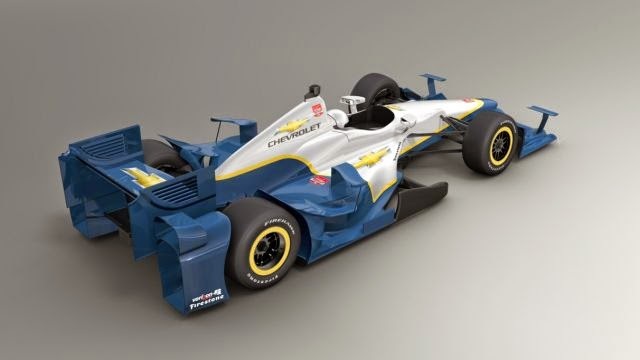 Nevertheless, the teams have to conform to them and update next year’s car based on them. With that, you get uncertainty in the performance of the car due to the limited testing sessions in the Formula One off-season. There are only a few opportunities for teams to test out the changes they have made before they have to get the cars to the grid at Melbourne for the season to start. But are teams getting any more reliable than they were in the early 90’s? Are they able to adapt better, quicker, and use the testing sessions early on in the season more efficiently to eliminate mechanical failures? 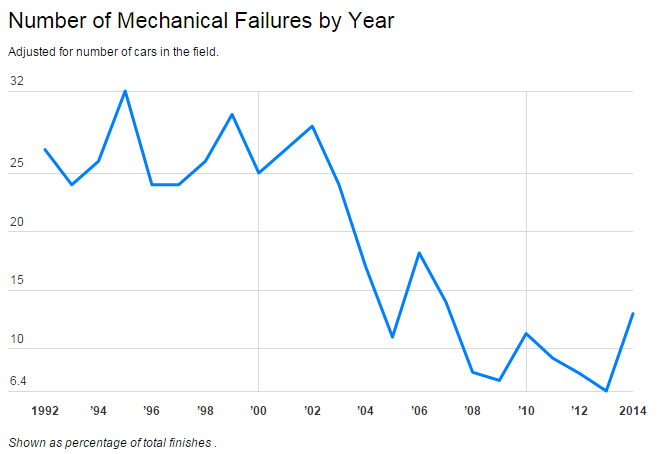 A look at mechanical failures by year shows that, in short, reliability is improving overall as time goes by. The numbers shown are percentages of mechanical failures by year, starting with 1992. They were calculated by taking the total number of mechanical failures of a given year and dividing it by the total number of possible finishes if every car finished every race, (the total). Crashes, racing incidents, and disqualifications were not included because they do not have anything to do with the mechanical reliability of the car. If a crash was caused by a brake failure or other mechanical issue, then it was included. As a whole, the percentage of mechanical failures is decreasing. In 1992, there were 130 mechanical failures which is about 27% of all the finishes, an enormous amount by today’s standards. Last year the sport saw just 27 failures, or about 6.4%. That means that in 2014, there were 20.6% less failures than there were 23 years ago. By looking at the data, you can also see the spikes where unreliability drastically improved or decreased. 2002 to 2004 specifically saw a large drop in mechanical failures. It went from 29% to 17%, a drop of 12 points, in those years. The reason? This rule was introduced at the start of the 2003 season and limited the work teams could do on the cars after qualifying started. Prior to the rule being implemented, teams could have a qualifying and a race setup ready to go on the car. Once qualifying was over (where setups built for speed would be used), race setups would go on (built for longer stints, better tire wear, ect.). Parc Ferme stopped this practice and limited the teams to performing very minor adjustments such as changing the tires and small setup tweaks. With teams having to focus all weekend on one setup for qualifying and the race, reliability improved. 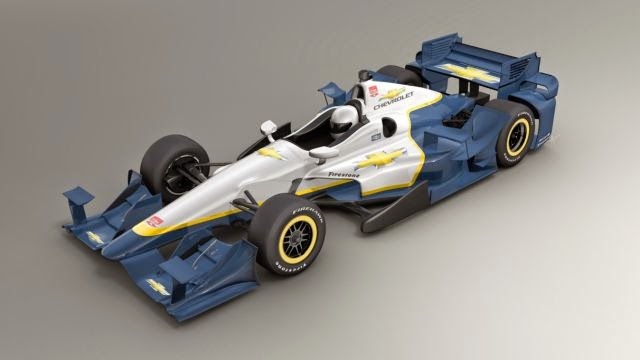 They had all their attention working on one car for the race, not diverted to multiple setups, and reliability benefited greatly the next two years as teams came to grip with the new rule. The percentage of mechanical failures has never come close to the 29% it was at pre-Parc Ferme rule, an attribution to its success in that department. Another time that we saw a big change was 2005-2006. This was when the FIA and Formula One decided to switch from V10 to V8 engines to limit the increasing engine power levels. With the new engine in place, teams had to do some major re-modifications to their cars. Along with those changes came changes in reliability. Failures rose from 11% to 18.2% for the 2006 season, a 7.2 point increase. This was a significant rule change and teams were not as successful at implementing them as they had been previously with the V10’s. 2014 saw a plethora of new changes to the rule books. Just like 05′-06′, these adaptations saw an effect on the performance of the cars. High up on the laundry list of adaptations was the engine switch, this time from V8’s down to V6’s. There was a 6.6 point increase in the number of mechanical failures from the prior year, climbing up to 13%. The engine wasn’t the only contributing factor, though, new aero regulations, tire weight, and the switch from KERS to ERS all no doubt had an impact. 2015, however, doesn’t have many changes from 2014 in terms of rules and car specifications that need to be met. This should mean that reliability rates increase (lower in percentage) for the 2015 season.